Roderick the Wonder Guinea pig has a lump. A big, swollen, nasty lump. On his, um, private bits. Where his testicles used to be. Yesterday afternoon, as I picked him up for his cuddle and to get him out of the way while I cleaned out his hutch, I noticed he was swollen at his back end. Which he shouldn’t be, having had his castration operation six weeks ago. Immediate panic and meltdown from me, imagining all the worst things. It’s cancer, it’s an abscess, he’s got a hernia, he’s got faecal impaction etc etc etc ad nauseam. Because panicking is what I do in any situation that is out of my control. Or even in my control. I am a world-class stress-head. I phoned Roderick’s vet and tried to get an appointment. I couldn’t get in for two days. I couldn’t leave him that long so I phoned another vet and made the earliest appointment that I could, which was for this morning. I phoned my husband and said I had to cancel our scheduled coffee’n’cake meetup for our wedding anniversary. He said he’d be home right away. As he walked in the door I was sitting on the floor, wailing and sobbing. He gave me a cuddle and went and had a look at Roderick, who, of course, was exhibiting no signs of anything more dramatic than being impatient for his dinner. Well, he still had a big lump but it wasn’t bothering him. In my panic, I had failed to notice all the good signs in the patient ie he was eating, pooping, peeing, jumping about like normal. So I put my panic on hold for a while. Nothing more I could do for the night anyway and he would be seeing a vet in the morning. This morning, nice and early we trekked off to the vet, Luckily it is only a couple of minutes drive away so Roderick didn’t have to be in the car for too long. Since his neutering he is suspicious of any car journey. We didn’t have long to wait at the vets and soon Roderick was being examined while his “Mummy” looked on nervously, expecting the worst. The vet was very young, but very nice and actually seemed to know what he was doing and was familiar with guinea pig care and treatment. He checked Roderick over thoroughly and said the lump was most likely an abscess. 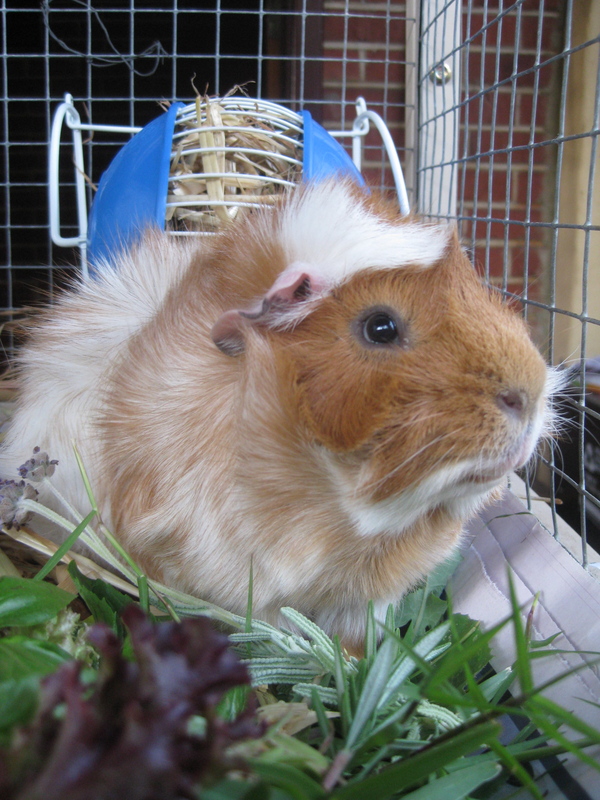 No uncommon in guinea pigs but treatable. He gave me a course of antibiotics which my little man will need to take for 10 days. Hopefully the abscess will resolve in that time but if not, if there’s even a slight bit of infection and lumpiness left, we will need to have him back in for a quick anaesthetic and to lance the abscess. Panic decreasing but not over yet. I just feel terrible that I didn’t notice the lump. I’m sure it wasn’t there a couple of days ago but what if it was and I missed? He healed up so nicely from his surgery that I was sure everything was ok. I feel like such a bad Mummy! To make things worse (and more mortifying), he needs to go on a diet! I knew he was a fatty and had put on a lot of weight recently but I think I needed someone to officially tell me he’s getting a bit porky. So I’ll work on reducing his diet (which is already 95% veggies so I’m not sure what is making him fat…) and maybe encourage him to do some exercise. Wonder f they make StairMasters for guinea pigs? Happy Anniversary for yesterday to my long-suffering husband and Happy Halloween to you all. Make all your ghosts and ghoulies be friendly and lump-free!